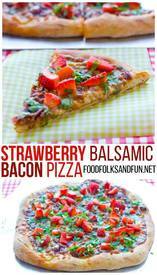 Strawberry Pizza with Bacon and Balsamic is one of my favorite pizza creations. This pizza recipe packs layers of savory and sweet flavors. The sauce for this pizza is a blend of strawberry jam and a balsamic reduction with a dash of sriracha! Then I layer the pizza with crisp Bacon, red onion, and a mix of mozzarella and Monterey Jack cheese. Once the pizza comes out of the oven it’s sprinkles with diced strawberries and chopped cilantro! Are you hungry yet?